Since our freshman year, my friend Jenna and I have visited each other every semester of college. 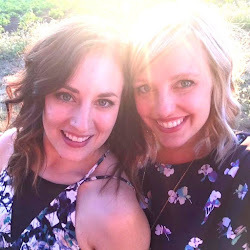 Jenna is a senior at PLU and a big fan of our blog! We decided that we should go to a happy hour so she could be featured in a post. Saturday night we wanted to sit down and have a yummy drink before meeting up with some of our guy friends. We went to Bartini (corner-ish of NW 21st and Flanders) on my 21st and remembered their variety of drink choices, so we chose to go back for their late night happy hour. When we first arrived around 10:45 pm it was pretty packed, but it didn't take long to get a table and order drinks. Katie and Leslie ordered the Blackberry Lemon Drop for $6, quite tasty and the cheapest drink on the menu. 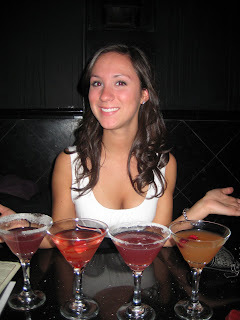 Jenna got a French Kiss ($8) and I got a Passiontini ($7). All very good. Katie, being captain of a dance team, had to perform earlier that evening and thought it may be a good idea to eat dinner before drinking too much. Their happy hour menu had a lot of food choices, but we had already eaten. 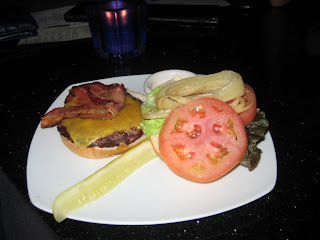 Katie chose a Bacon Cheeseburger, only $5, so it was a pretty good deal. You may be thinking this place sounds AWESOME, but there were some disappointments. First of all, while Katie was eating her burger she began to imagine what the dirty mirrors and black walls looked like in the daylight and we all agreed we were happy to be there at night. Second, the waitress was impatient, slightly snappy, and borderline threw Jenna's Dirty Martini (second drink) on the table. Also she forgot to order Katie's burger for a while, tended to assume we didn't want more to drink, AND she told me a shot of vodka was $4, but then changed it to $5.50 (annoying). Strangly she became super friendly when she rushed to close out our tab since she was ready to leave work. But maybe our waitress isn't a good representative of the service, so their drinks and happy hour menu might make it worth a try.